(SKNIS): Minister of Health, Honourable Eugene Hamilton has described the vaccination coverage rate of St. Kitts and Nevis as “world class” during the last sitting of National Assembly, held April 27, 2016. He was at the time acknowledging that the Federation is commemorating Vaccination Week in the Americas under the theme “Go for the Gold, Get Vaccinated.” He noted that currently, there are zero cases of measles, zero cases of polio and other vaccine-preventable diseases. The Pan American Health Organisation (PAHO) was thanked for its four decades of outstanding work. Minister Hamilton had specific words of advice for adults including parliamentarians. The activities in commemoration of Vaccination Week in the Americas include a day that is reserved for parliamentarians and permanent secretaries to get their vaccinations against yellow fever, specifically Tuesday, April 26. 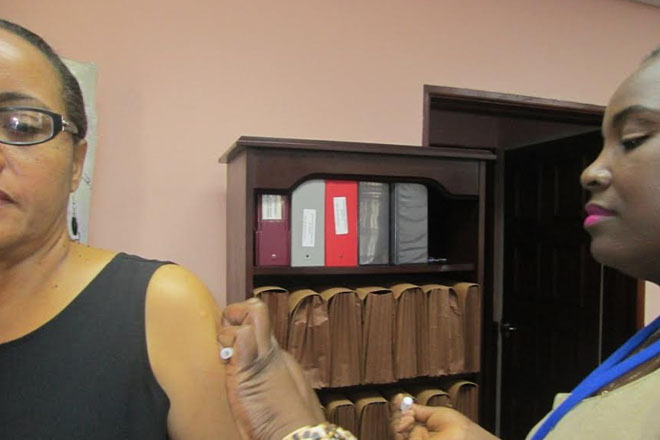 Today, April 28 there was training for national healthcare workers on the Expanded Programme on Immunization (EPI), while tomorrow, April 29, there will be two concurrent health fairs, one in Basseterre, St. Kitts and the other in Charlestown, Nevis. Activities at the health fairs will include the vaccination of Parks and Beaches Workers along with blood pressure and blood glucose screening and point of care rapid HIV testing, as well as the customary health education.